← 290 "The Frying Game"
The Simpsons run to the couch, only to find The Blue Man Group performing. "Poppa's Got a Brand New Badge" is the twenty-second episode of the thirteenth season. It originally aired on May 22, 2002. The episode was written by Dana Gould and directed by Pete Michels. Joe Mantegna reprises his role as Fat Tony. "Homer accidentally causes an electrical blackout in Springfield, and all of the citizens begin looting the town's businesses. Chief Wiggum is useless at restoring order, so Homer takes the law into his own hands, starts a private police force, and becomes a policeman." During a scorching heatwave, Homer plugs in a singing/dancing Santa to try and make the family feel cooler. This action causes all of Springfield to experience a blackout, as the Nuclear Power Plant is unable to cope with so many appliances demanding power at once. Lenny and Carl spark off a massive looting spree after crashing their cars into each other - then a store window - whilst talking to each other on their cell-phones. The Simpsons set-up chairs on their roof to watch the thievery, and wait for the police to arrive. After accidentally letting slip to the crowds that the police are not prepared to use force the mob starts to smash up the police car. 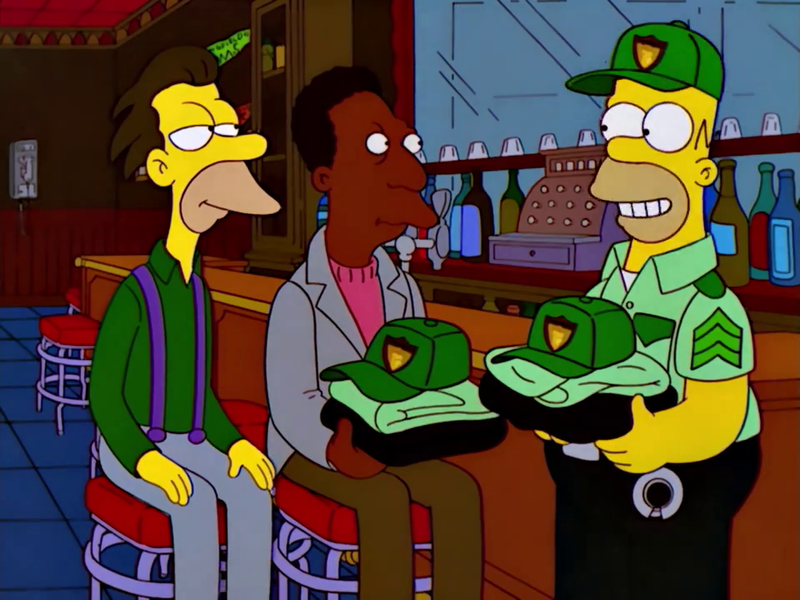 Later, when Homer tracks down the thief of Lisa's dolls (by going to The Wooly Bully, where he discovered it was Jimbo), and saves Apu from being robbed and shot - again (by tossing hot nacho cheese on Snake), he decides to start up a security company, Springshield, to protect the town, as the police are now a joke to everybody. Homer enlists Lenny and Carl to be his partners-in-law. When Mayor Quimby discovers Chief Wiggum trying to shoot a piñata with a shotgun he turns all of the town's police duties over Homer and Springshield. Later still, SpringShield busts Fat Tony after he sells weasels with cotton balls stuck to them as "Toy Poodles." Fat Tony then vows, over the radio, that he and his associates will gun Homer down if he doesn't skip town by noon the next day. In church, Homer asks for his fellow churchgoers to stand and fight with him, but none are willing - except Flanders, who Homer tells to "Shut up." Lenny and Carl lock themselves in a police cell as they too will not help. Meanwhile, Fat Tony is meeting with his associates. They travel to the Simpsons house - Sopranos style - and demand for Homer to come out. Just as the Mafia draw, gun-shots ring out and Fat Tony, and two others, drop their guns. More shots ring out and the rest of the gang fall down, injured. Homer swears to give his badge to the next guy he sees, Wiggum appears and takes the badge, claiming this is how he got the job the first time. Marge thanks Wiggum for saving Homer, but he says it wasn't him. Homer states that he must have a guardian angel (with a rifle). The scene shifts to Maggie's bedroom, and she is holding a rifle but quickly hides it under her mattress as Homer and Marge come to check on her. They think she is napping, and they recall the time she shot Mr. Burns. "She's like Clark Kent. When there's excitement, she's nowhere to be seen," says Homer. He pulls the blanket over Maggie and leaves. Maggie then opens her eyes and gives a grin to the 'camera'. Modified on April 8, 2018, at 07:15.